I’m excited for this week’s post by Courtney on edamame, as this is one food I consistently order out but never make in my own kitchen. I’ve got some good ideas now! This delicious treat is one of my absolute favorite appetizers in Japan! I love edamame and to be honest, no one does it like the Japanese (seriously I’ve tried at several restaurants here in the States and they all seem to botch it)! Edamame is a very common dish in izakayas (Japanese pubs) but you can find them virtually everywhere from convenience stores to sushi-go-rounds. Edamame is immature soybeans that are cooked while still in their pods. Within Asia, the common way to prep is to boil or steam the pods then sprinkle with salt. A second empty dish is served along with the edamame for the discarded pods after you remove the seeds. 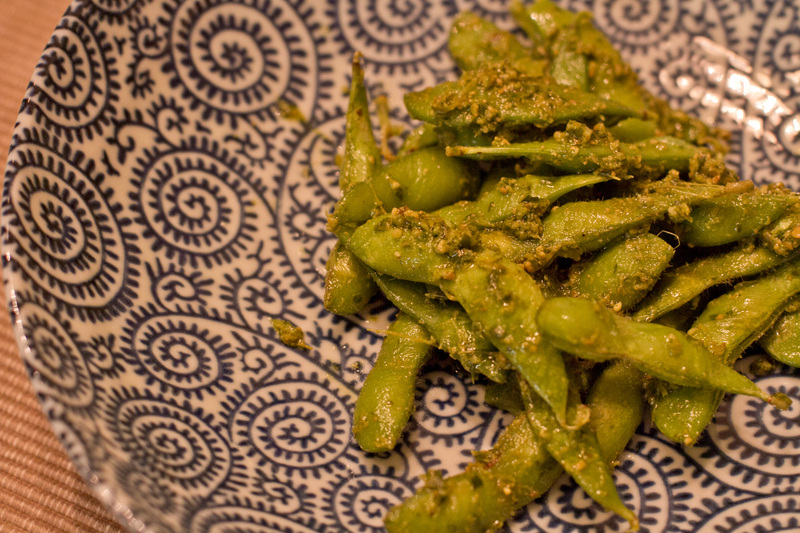 In most cases, edamame is usually served as a savory dish or by itself. However, in the region of Tohoku they use edamame seeds to make zunda, a sugary paste that is used in sweets in place of anko. While the traditional way of enjoying edamame with salt only is still my favorite, I really enjoy this recipe when I want something different. I first tried this dish at IKEMEN Ramen at the Shin-Yokohama Ramen Museum. IKEMEN was the Hollywood ramen shop that was famous for its ramen fusions. Italian-style ramen was one of these fusion. Hope you enjoy it as well! Cook edamame according to directions. While still warm, toss with basil pesto. Puree all ingredients together in a food processor or chopper. Yields ½ cup. Claiming to be better than Trader Joe’s edamame, they may actually be truthful in that claim! Our Thanksgiving feasts around the world always incorporated local flavors. A friend brought this to our celebration one year in Japan and it was hit. Simple but delicious! And also welcomed on the table year-round. A little spice makes it taste soooo good! How about a little East meets West with this Asian inspired quinoa salad. Perfect for lunch or dinner on those hot summer evenings. I had never heard of zunda until I took a wagashi cooking class in Kyoto. We were making mochi and yatsuhashi and she had zunda there as one of the fillings. I was shocked to find edamame in a sweet dish but it was the perfect replacement for azuki beans.